Though I studied journalism at university, I was intimidated by the thought of interviewing people, so I went into publishing, marketing and promotion before returning to journalism and writing for magazines including Bride to Be and Practical Parenting. I think I always wanted to write a novel and really became committed in 2000. My first novel, Lucy Springer Gets Even was published in January 2009, so it was a very long journey. The Callahan Split chronicles the lives and playing careers of sisters Annie and Samantha Callahan. Sibling rivalry and twists and turns abound… What was the inspiration for the novel? That’s a good question! For some reason I became fixated on the idea of tennis playing sisters…It’s not like I am an avid tennis player or passionately follow women’s tennis but I liked the idea of developing a competition between sisters and then explore how that might psychologically and emotionally challenge them. Throw in an absent mother and abandonment and commitment issues…well clearly, tensions and dramas will ensue. Both Annie and Samantha are such vastly different characters, Annie a carefree and relaxed kinda gal whereas Samantha is certainly more highly strung and singular in her focus on succeeding. So here’s a curveball – which character is your favourite, and what one character trait will most endear both Annie and Samantha to your readers? Another great question. I am going to say Samantha. Yes, she’s highly strung and often one-eyed but I do think her heart is in the right place most of the time. She has many fears, particularly regarding abandonment and failure, and I think those traits really come into play as we get to know her character. As the reader gets to know her, I hope they will have an understanding and sympathy for why Samantha behaves the way she does. Annie – loyalty – she chooses to see the good in people and focus on that. What was your biggest challenge in writing The Callahan Split? The Callahan Split was a real joy to write. In fact, it is my favourite novel. I loved exploring the sisters’ relationships with other women on the circuit. I would say the biggest challenge was making sure I got the tennis terms, tournaments and facts right. Hopefully I achieved that. A glass of champagne and a long soak in the tub! And then, I’m writing about Lily – a city gal who loses her job and boyfriend and takes off to the coast to begin a brand new life as a florist. Of course, she doesn’t know the first thing about flowers! Once upon a time, I made a New Year’s resolution to write a book. Like most people, I woke up on 1 January with a headache. Unlike most people who’d made resolutions the night before, I took two painkillers and started writing. The result was Lucy Springer Gets Even (Allen & Unwin, 2009), followed by What Kate Did Next (Allen & Unwin, 2010), Claudia’s Big Break (Allen & Unwin, 2011), Stella Makes Good (Allen & Unwin U, 2012), and It Started With A Kiss (Allen & Unwin, 2015). 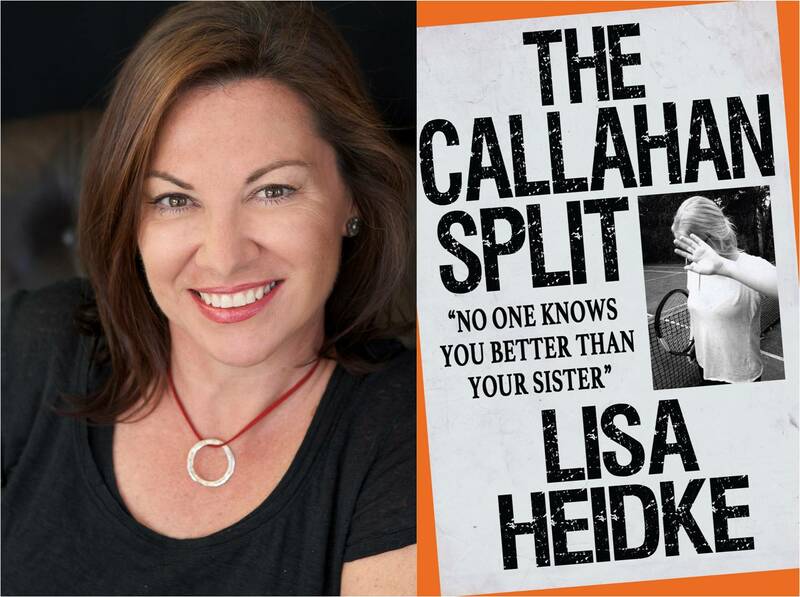 My sixth novel (and favourite), The Callahan Split, is out NOW! No one knows you better than your sister. Thanks for having me over, J’aimee!